Case file (brief) structure facilitates organisation and preparation of cases for trial. Your team benefits from the work of each member. Security features to keep your information safe. Cloudbrief provides convenient access to your files wherever you are. Cloudbrief is a new way for lawyers to organise and manage cases and matters online. This web based service permits secure access to a legal file and its documents; enabling a User, from any location with internet access (locally, interstate or overseas) to file, view and sort contents, and retrieve documents. The intuitive pro forma file structures support the workflow of litigation cases. Cloudbrief has inbuilt flexibility. This enables changes to be made to file structures in litigation cases, and for a file to be created to provide a secure workspace for commercial lawyers in transactional matters. Cloudbrief can be used by an entire firm, by workgroups or by individuals. It can provide a shared space for more than one law firm. It serves as an additional tool to create a central accessible and organised workspace, helping lawyers to be better organised. Cloudbrief can help you supervise the lawyers in your team. Cloudbrief includes a function that reports to the team leader on user activity on the team files. The structure of Cloudbrief enables the team leader, members of the team, and the client to see if and when external counsel was instructed, when advice was given, and what work has been done. Cloudbrief is a secure, intuitive and valuable online support tool for lawyers. The structured file system, based on more than 30 years of litigation experience, provides a way to access files and documents, wherever you are working. Access your files remotely by desktop, laptop, tablet (eg Ipad), or mobile phone. Access your brief in Court by computer or tablet. Organise manage and supervise your files. Secure access to your files, wherever you are. You don’t need to cart around bulky files all the time. An intuitive organised file structure for litigation cases based on 30 years’ experience. Reduce paper printing and storage costs. 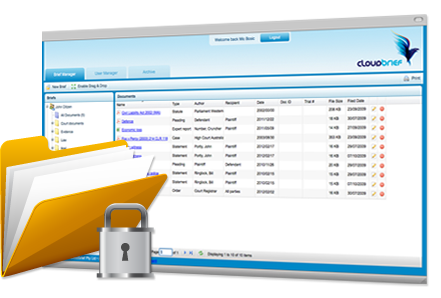 Full control of secure access to files and documents. Track additions and changes to files and user activity.